Regarded as one of the finest conditioned parkland courses in the country, Dromoland Castle Golf & Country Club is up there with the best. The course stretches over 6824 yards for men and 5242 yards for ladies. Set in the undulating Clare countryside, the parkland course is a test to any golfer. The course features tight fairways, fast greens, perfectly manicured bunkers and an abundance of trees. The River Rine acts as a significant course feature flowing throughout the parkland. It has been described as an experience never to be forgotten, presenting the pure challenge of golf to both amateur and professionals alike. The 18 hole golf course was picturesquely built in 1961, with the impressive 16th Century baronial Dromoland Castle acting as a majestic backdrop. It’s setting on the rolling green pastures and glistening lakes makes it a pleasure to play. In 2003 the parkland course was redesigned by the renowned pair, Ron Kirby and J.B. Carr and now acts as one of Ireland’s most prominent golf courses. The Walled Gardens, The Temple of Mercury and hand painted walls are just some of our favourite features. It’s a fantastic place to unwind after a day of golfing.The Fig Tree Restaurant serves food all day and private office lunches can also be catered for in the meeting area. The Clubhouse boasts a leisure centre and swimming pool. The Castle Hotel has also been splendidly refurbished, the perfect place to stay to compliment your trip. 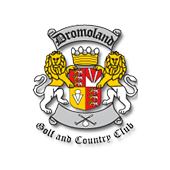 View Dromoland Castle score card. When playing Dromoland it would be hard to look past the Castle as your place of stay. With an extraordinary history stretching back to the 5th Century, the 5* Castle Hotel was originally the ancestral home of one of the few families of Gaelic Royalty, direct descendants of Brian Boru, High King of Ireland. 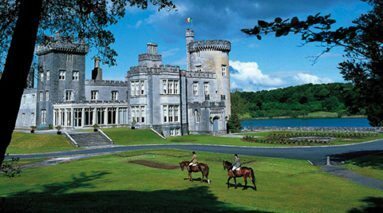 Situated just 8 miles from Shannon International Airport, the 5 star Dromoland Castle Hotel is the ideal base from which to explore the vibrant cities of Limerick and Galway, the magnificent Shannon region and Ireland’s rugged West Coast. The other option close by would be the 3* Inn at Dromoland, with its rooms recently renovated and the excellent Shannigans Bar and Restaurant on site, it’s an excellent alternative. If you would prefer to stay in a more central location the 4* Old Ground in Ennis or the 4* Clarion Hotel in Limerick would be your best options, only 15 and 25 minutes away respectively. 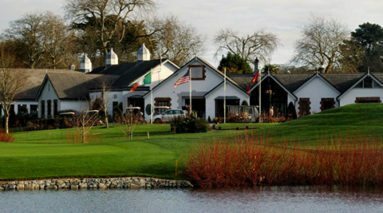 There are 4 different dining options in Dromoland following your round. In the resort, there is a casual bar in the Clubhouse, the slightly more formal Fig Tree Restaurant and the award winning fine dining option of the Earl of Thomond Restaurant. 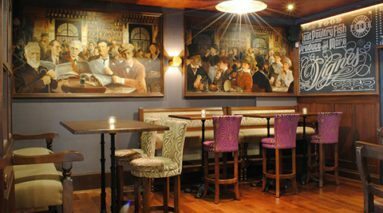 Close by, at the Inn at Dromoland, there is the amazing new gastro pub, Shannigans. For a drink, you also have the option of the atmospheric Cocktail Bar on the Castle grounds. 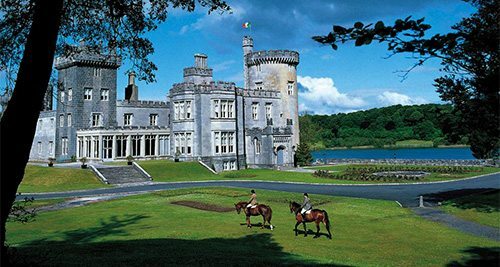 While Dromoland offers many on site attractions such as boating on the lake, archery classes, falconry or just strolling through the 400 acres Dromoland estate, there are many local attractions and sightseeing attractions nearby and along the Wild Atlantic Way. The world renowned Cliffs of Moher and The Burren are all within easy reach. The capital town of Co Clare, Ennis is only 16 mins away. This medieval town which is one of the host towns for the world famous Fleadh Cheoil na hEireann music festival, offers local walking tours to the likes of Ennis Friary, Ennis Cathedral and Clare Museum. The town is known as the Boutique Capital of Ireland. The famous village of Bunratty is only 15 mins away, where you can visit the Bunratty Castle and Folk Park or even attend the famous Medieval Banquet. Bunratty has great shopping and restaurants and bars such as Durty Nellys, The Creamery and Gallaghers.